The Aurora Incident, the 1897 UFO Incident in Aurora, Texas. One hundred and seven-odd years ago, a most unusual incident occurred in the tiny North Texas town of Aurora. It was here that one of the earliest documented encounters with an alien life form took place, in the early morning hours of April 19, 1897. Aurora, Texas, is literally "the town that almost was" as the town�s tiny history book states, and one of its few, if not its only, claim to fame is the burial site of an alien pilot that crashed there in his �airship�, the most memorable event in a string of UFO sightings which covered a three state area between 1895 and 1898. Aurora is located just off US 287 west of Rhome, about a mile south, on State Highway 114 to Bridgeport. There is a sign beside the highway that says CEMETERY, and points south toward the graveyard. Interestingly enough, the historical marker at the site actually includes the word "spaceship". Newspapers, along with diaries and letters by local residents, reported that an alien craft hit a windmill and was torn to pieces, along with its occupant in April, 1897. A 1986 movie, "The Aurora Encounter," produced by Charles B. Pierce, tells the tale. 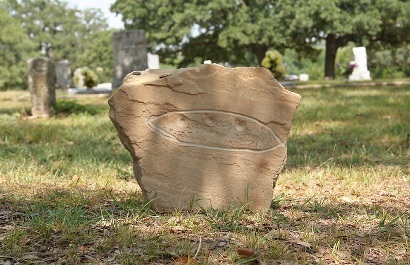 The official historical marker was installed by the State of Texas, and although nobody knows exactly where the grave is located, it is certain that the alien was, in fact, buried in the Aurora Cemetery, after the efforts of the local doctor failed to save it�s life following the crash. There is, unfortunately, no sign of the tombstone. It was stolen some years ago and never recovered. There are, however, picture records of its existence. There is currently a renewed movement in town to exhume the body of the alien, replace the headstone and do a complete search for remains of the crash. Also, there have been several interesting pieces of metal found in the area that have been confiscated for analysis by the military and never returned. 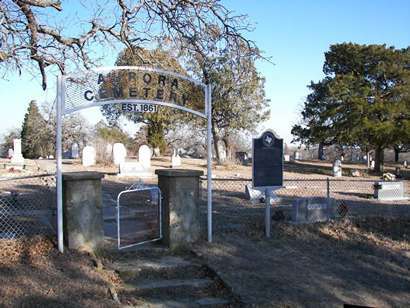 �The oldest known graves, here, dating from as early as the 1860s, are those of the Randall and Rowlett families. Finis Dudley Beauchamp (1825-1893), a Confederate veteran from Mississippi, donated the 3-acre site to the newly- formed Aurora Lodge No. 479, A. F. & A.M., in 1877. For many years, this community burial ground was known as Masonic Cemetery. Beauchamp, his wife Caroline (1829-1915), and others in their family are buried here. An epidemic which struck the village in 1891 added hundreds of graves to the plot. Called "Spotted Fever" by the settlers, the disease is now thought to be a form of meningitis. Located in Aurora Cemetery is the gravestone of the infant Nellie Burris (1891-1893) with its often-quoted epitaph: "As I was so soon done, I don't know why I was begun." This site is also well-known because of the legend that a spaceship crashed nearby in 1897 and the pilot, killed in the crash, was buried here. Struck by epidemic and crop failure and bypassed by the railroad, the original town of Aurora almost disappeared, but the cemetery remains in use with over 800 graves. Veterans of the Civil War, World Wars I and II, and the Korean and Vietnam conflicts are interred here�. Aurora brings up images of high-speed space travel. In fact, the newest space shuttle in the NASA fleet is named 'Aurora' after the UFO incident that took place in 1897. In 1997, the 100th anniversary of the crash of the unknown �airship� in Aurora, the TV show "Sightings" brought renewed interest to the topic with a special called �One Hundred Years of UFO Cover-ups�, that featured the crash, the efforts of the local doctor to help the dying alien, and the burial of his body in the town cemetery. This incident has been covered up and ridiculed by the U.S. Government (a standard operating procedure of the MAJESTIC 12 group) and has been widely reported to be a hoax (a weather balloon?). This, to say the least, sounds a lot like Roswell in 1947? The US government has a long history of cover-ups in regards to such occurrences. It is hoped that the current, renewed interest in the incident will last, and that a new investigation will clear up the Aurora event for good, although much time has passed. It is tragic that most, if not all of the original witnesses are long dead, for, at one time, up until around the early seventies, there were quite a few people still living who had been children at the time and not only remember the crash, but remember a rash of �airship� sightings, all over East and North-Central Texas, as well as the stories which were passed down to them from their �elders�. Almost everyone who grew up in those parts of the state have heard stories from their grandparents, or other �old folks� about such events, many of whom were �substantial� citizens, including doctors, clergymen, judges, army personnel, sheriffs and other professionals. The Aurora crash was, in fact, the culminating event in a rash of �airship� sightings in East and Northeast Texas, Oklahoma, North and Central Louisiana in the period between 1895 and 1898. Robert Atkinson, of Center, Texas, a veteran of the Spanish American War, often told of seeing, as a teenager, strange, �flashing lights� in the sky, as did Polk Burns of the same city. Similar incidents were recountered by Bud Knight, a prominent resident of San Augustine, Texas, who died in 1981 at the age of 108. Lee Choron, who died in 1976 at the age of 94 recalled seeing �moving lights flashing in the sky� while living in Swift, Texas (near Nacogdoches) while in his �teens�. Nor, were civic records and town newspapers of the time completely silent on the matter. Reports, although not common, do exist. On April 22, 1897 in the small central Texas town of Rockland, John M. Barclay was intrigued when his dog barked furiously and a high-pitched noise was heard. He went out, saw a flying object circling about 20 feet above ground. He described it as having an elongated shape, with protrusions and blinding lights, it went dark when it landed, only a short distance from his home. Barclay was met by a man who informed him that his purpose was peaceful and requested some common hardware items to repair the craft. He paid with a ten-dollar bill and took off "like a bullet out of a gun." On that same day, April 22, 1897, some one hundred miles away, in the community of Josserand, Texas, Frank Nichols, who lived some five miles east of Josserand, and was one of its most respected citizens, was awakened by what he called a �machine noise�. Looking outside, he saw a heavy, lighted object land in his wheat field. He walked toward it, but was stopped by two men who asked permission to draw water from his well. He then had a discussion with half a dozen �short, dark men� men, apparently the crew of the strange machine. He was told how it worked but could not follow the explanation. Three days later, on April 25, 1897, in Merkel, Texas. People returning from church served a heavy object being dragged along the ground by a rope or cable, attached to a �cigar shaped� lying craft. As the assembled crowd watched, the line managed to get caught in a railroad track. The craft was too high for its structure to be visible but protrusions and a light could be distinguished. After the craft hovered in place for about 10 minutes, a man came down along the rope cut the end free, and went back aboard the craft, which flew away toward the northeast. The man was described by all witnesses, as being small and dressed in a light blue uniform. The next day, late in the evening of April 26, 1897, near the town of Aquila, in South Texas. A local lawyer, whose name was not reported by the press, was surprised to see a lighted object fly quietly overhead as he was riding from his office to his home, just outside the city limits. His horse was scared and nearly toppled his carriage. The object was large, and �oblong�, and sported a bright light that was observed to be sweeping the ground below the object. When the main light was turned off, a number of smaller lights became visible on the underside of the dark colored, metallic craft, which revealed an elongated, transparent canopy. It continued forward, toward a hill, some seven miles to the south of Aquila. When the witness passed the same way, approximately one hour later, he saw the object rising. It reached the altitude of the cloud ceiling and flew to the northeast at a fantastic speed with periodic flashes of light. These accounts, all given by respectable witnesses, separated by several hundred miles, yet all in a direct line with Aurora, describe a very similar object. It must be remembered that in 1897, distances were much greater than they are today, and news traveled at a much slower rate. It is inconceivable that there could have been any collusion between witnesses, and highly unlikely that people living in towns separated by several hundred miles, could have heard news or read accounts of happenings in other towns within the space of two or three days. This was a time, it must be remembered, when most news traveled by wire, or by railroad, and unless there was a critical need for residents of one region to have news of another, the expense of wiring such news was avoided. Much may be made, in some quarters of the �quaint� descriptions given of the object� it, indeed, must be a single object, or at least identical objects� such as the presence of �machine noises� and �ropes�. This is perfectly understandable in light of the fact that this was a time before sophisticated machinery, especially sophisticated flying machinery was common, or even, for that matter, known. It would be six years before the Wright Brothers would take their first, halting, leap above the ground, and the dirigible airships of such pioneers as the Count von Zeplein, were in the very early stages of development, a continent and an ocean away. Certainly no native of East, Central or South Texas had ever seen such an object. It is highly unlikely that very many of them had even heard of such things. Science Fiction of the day was limited to the works of Jules Verne, and the very early works of Herbert George Wells, and it is unlikely in the extreme that residents of a tiny Texas town, only a few years removed from fighting for it�s survival with the Apaches and Comanches would have access to such current works. The point, is this. The residents of Aquila, Hillsboro, Merkel, Jossarand, Nacogdoches, Swift and Aurora, would describe what they saw in terms that they understood, and could relate to. Any unusual sound, emanating from an obviously �manmade� object would be described as a �machine sound�. Likewise, any form of line, tie-down or connector would be described as a rope, cable or line. A classic example of such a description would be the existence of the �cargo� cults of the South Pacific� religious sects of islanders who being members of a pre-industrial, stone age culture, worship the airplanes that their ancestors first saw during the Second World War, and revere the crews as Gods who brought gifts� �cargo� from the sky. Far fetched? Not at all. Imagine how anyone living today might describe an object from a thousand years or, or so, in our own future. It is also worthwhile, at this point, to repeat the fact that people of this time and place, late 19th Century Texas, were extremely conservative in nature, skeptical by necessity, and most unlikely to take off on flights of fancy. There would simply be nothing to be gained from concocting a story concerning such a thing as an �airship." They would not only not be believed, their sanity, sobriety and competence would have come into serious question. Unlike today, when, as one must admit, such accounts are commonly hoaxed as an attempt to gain attention and momentary fame, this simply would not have been the case in 1897. The most likely result of such a story, unless absolutely and verifiably true would have been shunning by the community as the �village idiot� or as the �town drunk�. Worse, in the primarily Protestant Fundamentalist religious atmosphere of the time, which, by the way, has changed but little since that time, one would have been considered �blasphemous�, �sacrilegious� and possibly even �Satanic�, and definitely shunned by most �upright� and �upstanding� citizens of the community.